Curt Joa: Located in Sheboygan Falls, Wisconsin. Joa is one of the oldest disposable diaper machine makers in the world, established in 1932. They have experience with machines for Baby Diapers, Adult Incontinence, Training Pants and Sanitary Napkins. They specialize in large diaper machines, some running up to 1200 diapers per minute. I have known them for more than 28 years; they have grown at least 3 times during this period. Fameccanica: Located near Pescara in Italy, Fameccanica was established in 1975. They are probably the largest diaper machine builders in Europe. They make machines for sanitary napkins, baby diapers, adult incontinence products and training pants. This is a very stable company where employees turnover is rather low, somewhat unusual for most Italian machine builders. Recently they have opened a new diaper factory in China. I have known Fameccanica for more than 25 years. GDM: An Italian machine builder, GDM started operations in late 1995 from two formerly existing companies: Nuova Red Italiana and Tekma, which joined together to form the new company. GDM is located in Offanengo, Italy. They manufacture sanitary napkins, baby diapers and adult incontinence machines; they also make high speed equipment. GDM also builds machines in South America at the GD do Brasil factory. GD do Brasil: This is the Brazilian arm of the Italian machine builder GDM. Started operations in Brazil in 1985 with packaging equipment for the tobacco industry and later started with diaper machines in 1996. GD do Brasil is located in Sao Paulo, Brazil. They specialize in medium capacity machines. They manufacture machines for sanitary napkins, baby diapers and adult incontinence, in addition to special accessories like the horizontal stacker shown in the picture. Han Wei: Located in China, They make sanitary napkin, baby wipes, baby diaper and adult incontinence machines. Han-Wei started first with only sanitary napkin machines in 1993 but now produces machines for a full line of disposable absorbent products. This is a very active participant, with machines in every diaper industry show such as Index or Idea. Peixin: This is a Chinese-Foreign joint venture located in Quanzhou, China. Peixin was established in 1989; they have been exporting machines to many countries, specially in Asia and Middle East. Peixin is a builder of machines for sanitary napkins, baby diapers and adult incontinence products. Viola, Md: They are located near Milan, Italy. They make sanitary napkin machines, baby diaper and adult incontinence products’ machines. Viola is well known for building their own hot melt tanks, dust collectors and SAP applicators. Viola is present in most diaper industry shows. Zuiko: One of the oldest manufacturers of equipment located in Osaka, Japan. Zuiko is probably the largest diaper machine builder in Asia. 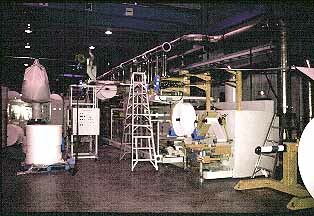 They are famous for their training pant machines; they also make sanitary, baby diaper and adult incontinence machines. Zuiko has been a leader of disposable diaper machines for quite some time and their machines are known to be built to last. I have known Zuiko for more than 25 years. HCH: It is the largest and best known equipment manufacturer in China. They were one of the first to be in buisness in China. They are currently very acvtive exporting machines all over the world. An actual diaper factory in operation: For a nice video of an actual diaper factory, please use this link courtesy of Abena in Denmark, please be patient as it takes a few minutes to load but it is worth it: http://www.abena.com/Files/Billeder/video.wmv Abena is one of the suppliers of my client Ahold in Europe.